The Incas were highly developed in many respects, as we know were great engineers, they had great advances in communication with the use of quipu, also possessed a large economy based on advanced agriculture developed on platforms. This formidable form of agriculture, kept an empire consisting of some 20 million people, where ordinary people produced the lands belonging to the state ruled by the Inca and royalty (Inca family) distributed in all the cities of Tahuantinsuyo, ruled from the city of Cusco (capital of the empire). In the Inca Society worshiped many gods, so many kinds of offerings were made, among these, the offerings to the sun, the earth, the water, the moon, the stars, fire, wind, etc. This great social structure affects religion, as they worshiped natural elements that this civilization associated with agriculture. The state potentiated their religious beliefs, organizing numerous ceremonies where the people offered "on a voluntary basis" gifts to their gods. For both the Inca and for the current Andean man, the offerings have a sense of reconciliation with the spiritual forces in order to prevent accidents, and ask favors of nature. The offerings to the Mother Earth or Pachamama originated in the empire of the Incas and is practiced today especially in Andean communities. It is a symbolic offering that man returns to Earth (Pachamama) what has taken from it. The primary purpose is gratitude and reciprocity between human beings and nature. With this offering the Andean man asks the earth (Pachamama), permission to open and restore some fruit. These rituals are also intented to Apus (spirit of the sacred mountains); the Apu symbolizes to the male while the nature and Pachamama symbolize the female. 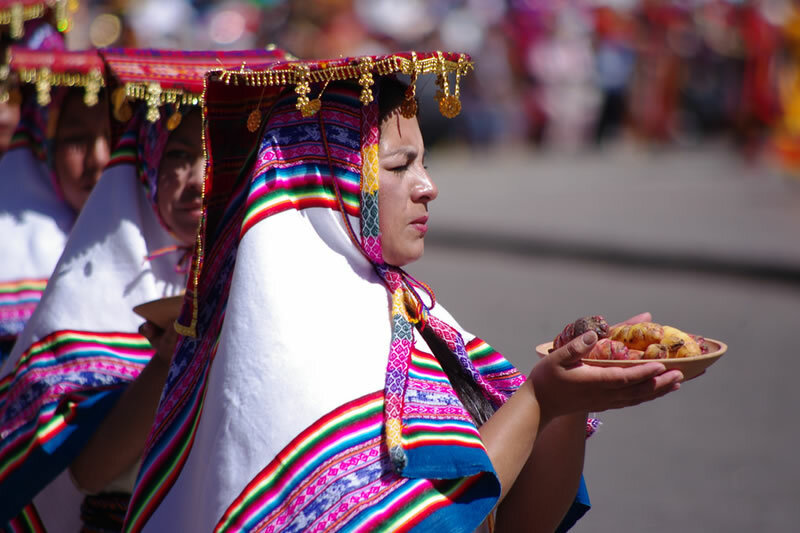 In the Inca cosmovision, the offering is an act of reciprocity, is the realization of universal and cosmic justice that helps the natural balance. It is said that the rite of Capacocha had the mision to maintain "the cosmic order" in difficult circumstances to the Inca empire. These circumstances include the emperor’s death, fertility for planting, abundance of crops or natural disaster. The ceremony takes place in ceremonial places, shrines or huacas located throughout the Tahuantinsuyo; were sacred spaces where the Incas were connected with their ancestors. However, other studies show some sacrifices were used as warnings for invading peoples. Of the four suyos of the Empire were sent children to Cusco, chosen for their beauty and physical perfection (free from defects), usually children of caciques. The children were symbols of purity before the gods, the girls were maided in the House of the Virgins of the Sun (Acllahuasi), where they lived from age eight until the time of sacrifice. Once in Cusco, they worshiped the sun, the Lightning and the mummies of the royal dynasty who were the principal deities. Those chosen for the offering slowly climbed the sacred places (like Machu Picchu). The creature wore their best clothes, gave him to drink chicha (corn liquor), and once asleep was placed in a pit under the earth, besides a rich trousseau. According to Inca belief, children offered did not die but they pass to another life where they could meet with their ancestors and take care of those who were still on earth. Children were considered like purifiers beings of the tombs, and they highly valued the "offering children". However, most families preferred not to give their children to the State. To date they have identified about 35 burials archaeologically associated with this Inca practice within the mountains of the Andes and throughout the territory that was occupied by this immense empire. Here are some of them. The girl of Tanta Carhua, in Cusco, Peru. The child of the hill plomo, in Santiago de Chile. Children of Salta, at the summit of Llullaillaco Volcano, in Salta Argentina (northeastern Argentina, border with Chile). The mummy "Juanita" (the Lady of Ampato), Mount Ampato in Arequipa, Peru.